Shrine of Imām al-Ḥusayn (a) (Arabic: العَتَبَة الحُسَینیَّة) is the resting place of Imam al-Husayn (a), some people from Banu Hashim and some of his companions in the ‌Battle of Karbala, who were martyred on Muharram 10th, 61/October 10, 680 in a battle with the army of 'Ubayd Allah b. Ziyad. Al-Mukhtar al-Thaqafi made the first building on Imam al-Husayn's (a) grave. The building was later reconstructed, and developed by Shias and followers of Ahl al-Bayt (a), especially rulers and governors. Visiting Imam al-Husayn's (a) shrine is a Shiite practice recommended in Shiite hadiths. Most visitors or pilgrims congregate in Imam al-Husayn's (a) shrine on Ashura, Arba'in, and Sha'ban 15th. In Shiite fiqh, there are rulings specific to Imam al-Husayn's (a) shrine and its soil. After the martyrdom of Imam al-Husayn (a) and his companions, a clan of Banu Asad buried their corpses where they were martyred. The only sign on Imam al-Husayn's (a) grave at the time was a lump of soil. When al-Mukhtar al-Thaqafi triumphed in his uprising for the vengeance of Imam al-Husayn (a) in Sha'ban of 65/March 685, he built the first mausoleum for Imam al-Husayn's (a) grave with a dome made of bricks and plasters. The building consisted in an area with a ceiling and a mosque with two gates—one to the east and one to the west. Since many Shiites visited Imam al-Husayn's (a) mausoleum, Harun al-Rashid ordered some of his soldiers to destroy the mosque built on Imam al-Husayn's (a) grave as well as the one built on Abu l-Fadl al-'Abbas's (a). Harun had also asked them to cut the cedar tree that had grown near Imam al-Husayn's (a) grave (and was used as a sign for the grave) and to raze the grave. When al-Ma'mun al-'Abbasi took over the caliphate, all Abbasids opposed him. So in order to reinforce and establish his power against their oppositions, al-Ma'mun appealed to Imam 'Ali's (a) progeny and his Shiites. Thus he reconstructed Imam al-Husayn's (a) mausoleum and allowed Shiites to visit the place as well as the graves of other Imams. The building made at the command of al-Ma'mun was there until 232/846-7, but when al-Mutawakkil al-'Abbasi took over the power, he ordered the destruction of Imam al-Husayn's (a) mausoleum and submerged it with water. In the late 247/862, when al-Muntasir al-'Abbasi took over the caliphate, he ordered the construction of a dome on Imam al-Husayn's (a) mausoleum. The building remained intact until 273/886-7, that is, the period of al-Mu'tadid al-'Abbasi's caliphate. In Dhu l-Hijja 9, 273/May 7, 887, when pilgrims had gathered in Imam al-Husayn's (a) mausoleum on the Day of 'Arafa, the building was destroyed and some pilgrims were killed. After that, Imam al-Husayn's (a) grave remained without a building on it for 10 years until when al-Da'i al-Saghir took over the power. He ordered the construction of a building for Imam 'Ali's (a) and Imam al-Husayn's (a) shrines with tall domes and two gates, each including an area with ceilings. He also reconstructed the fortification around Imam al-Husayn's (a) shrine and the houses nearby. The building dates back to the years 279/893 to 289/902. During the caliphate of al-Ta'i' b. al-Muti' al-'Abbasi, 'Adud al-Dawla al-Daylami took over the power in Baghdad. In Jumada I, 371/981, he ordered the reconstruction of the shrine of Imam al-Husayn (a). In addition to the reconstruction of the building, 'Adud al-Dawla also decorated the place and built porches around the shrine. He decorated the darih with teak and precious cloth, with a wooden cover. He also donated some candlesticks to the shrine. This led to the flourishing and development of Karbala in matters religious, social, and commercial. In 369/979, Mu'izz al-Dawla al-Daylami assigned 'Imran b. Shahin with the governance of Batih, near Wasit, where 'Imran began to build a porch later known after the name of Sayyid Ibrahim al-Mujab. The mosque he built near the porch remained intact until the Safavid period. In this period, according to a fatwa permitting the attachment of mosques to the shrine of Imam al-Husayn (a), it was included within the developed building of the shrine. Parts of this mosque are still included in the shrine as storage for the shrine's carpets. It is located behind the porch known as the Nasiri Porch. In 407/1016, two of the big candles (lightening the shrine) fell on the carpets and set the curtains and covers on fire. The fire then spread to the porches and the dome such that only the walls, parts of the shrine and 'Imran b. Shahin's mosque remained intact. After taking over the power, Hasan b. Mufaddal b. Sahlan began to reconstruct the shrine, parts of which —including the domes and the porches— were burnt in fire. In 412/1021, he repaired the dome and the burnt parts and ordered the construction of a wall around the shrine. Years later, in 620/1223, Muhammad b. 'Abd al-Karim al-Kindi was appointed as al-Nasir li-Din Allah's minister. During his ministry, he repaired, renewed, and reconstructed the damaged parts of the shrine, covered the walls and the porches with teak, and installed a wooden box covered with precious cloth on the grave. Uways b. Hasan al-Jalayiri renewed the mosque and the shrine in 767/1365 and built a semicircular dome over the darih. 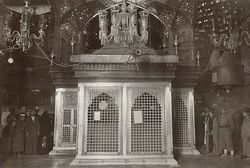 The dome rested on four porches on the four sides of Imam al-Husayn's (a) grave, and the exterior sides of each porch constituted a porch of the shrine. A large dome was built on these four porches, constituting a novel geometrical shape. The building was later completed by one of Uways's sons, Ahmad, in 786/1384. It was built in such a way that one could see the whole shrine and the mausoleum and the darih if he or she stood outside towards qibla. Moreover, pilgrims could walk around the darih. Ahmad al-Jalayiri built the portico opposite the courtyard, known as the Golden Portico as well as the mosque of the courtyard which is square-shaped around the shrine. He also decorated the porches and the internal building of the shrine with mirrors, inlays, and Kashan's tiles with portraits of natural sceneries. At Ahmad al-Jalayiri's command, the two minarets of the shrine were also decorated by yellow bricks of Kashan. In 914/1508, Shah Isma'il I conquered Baghdad. On the second day after the conquest, he visited Imam al-Husayn's (a) shrine and ordered his agents to gild the margins of Imam al-Husayn's (a) darih. In 92/1514, Shah Isma'il visited the shrine once again and ordered the construction of a teak box over the darih. In 932/1525, Shah Isma'il II donated a gorgeous netted, silver darih to Imam al-Husayn's (a) shrine. In 983/1575, 'Ali Pasha, reconstructed the dome of the shrine. In 1032/1623, Shah 'Abbas I constructed a copper darih for its box, and decorated the dome with Kashan's stones. In 1048/1638, Sultan Murad IV, an Ottoman king, visited Karbala, and ordered the exterior part of the dome to be whitened by plasters. In 1135/1722, Nadir Shah's wife, who had a great wealth at her disposal, ordered the administrators of the shrine to embark upon an extensive reconstruction. In 1155/1742, Nadir Shah visited Karbala and ordered the decoration of the existing buildings. He also donated precious gifts to the treasury of the shrine. In 1211/1796, Aqa Muhammad Khan Qajar ordered the decoration of the shrine's dome with gold. But in 1216/1801, Wahhabis attacked Karbala and destroyed the darih and the porches and stole all precious property in the treasury of the shrine. In 1227/1812, the shrine's building was wearing out. Thus people of Karbala wrote a letter to Fath 'Ali Shah Qajar and informed him of the damages. He sent a supervisor to check the expenses and the reconstruction and then ordered the reconstruction of the building and the renewal of the golden sheets of the dome. In 1232/1816, Fath 'Ali Shah Qajar built a new silver darih, gilded the dome's portico, and reconstructed everything that was destroyed by Wahhabis. In 1250/1834, Fath 'Ali Shah ordered the reconstruction of the dome as well as that of Abu l-Fadl al-'Abbas's (a) shrine. In 1273/1856, Nasir al-Din Shah renewed the dome and some of the golden covers, and in 1283/1866, he developed the courtyard of the shrine. In 1358/1939, Sayf al-Din Tahir, an Isma'ili missionary, changed the silver darih into a new one. In 1360/1941, he renewed one of the minarets which was completely destroyed. In 1367/1947, houses and religious schools near the shrine were destroyed in order to expand the shrine. In 1370/1950, the eastern side of the shrine was extended and was decorated with porches made of precious tiles. In 1371.1951, the dome of the shrine was reconstructed and decorated with golden tiles. In 1373/1953, the mirrors of the shrine's ceiling and porches were completely reconstructed and mosaics were brought there from Isfahan in order to decorate Imam al-Husayn's (a) and Abu l-Fadl al-'Abbas's (a) shrines. In this year, the upper part of the Qibla Portico (the Golden Portico) was gilded. In 1383/1963, the Reconstruction Committee of the shrine imported stones from Italy in order to construct the exterior walls of the shrine. In 1388/1968, pillars were imported from Iran and the old ceiling of the Portico was lifted. In 1392/1972, the reconstruction of the new Golden Portico started. In 1394/1974, the plan for the reconstruction and the harmonization of the courtyard was devised. The plan included the reconstruction of the portico, destruction of the western side of the courtyard and covering the walls with tiles. In 1395/1975, the reconstruction of Imam al-Husayn's (a) and Abu l-Fadl's (a) shrines continued, the walls of the courtyard were covered with tiles and a library and a museum were built on the western side. In 1396/1976, the Ministry of Endowment decorated and renewed the Golden Portico with tiles and inlays. In recent years, a ceiling was built on the courtyard. This is why, the dome and the minarets of the shrine are no longer visible from a distance. The courtyard of Imam al-Husayn's (a) shrine is the area including the porches of the shrine, also known as "jāmi'". Before 1948, bazaars and other buildings were adjacent to the shrine, with no street between them. In that year, a street was built around the shrine. The interior of the courtyard was rectangular-shaped, with two small additional sides—in fact it was hexagonal, just like the darih. However, in the expansion of the shrine in 1947, the two additional sides—one in the southeastern part and the other in the northeastern part—were removed, and thus the courtyard looks like a rectangular from the inside, though it seems oval from the outside. Before the expansion of the shrine in 1947, there were mosques and Islamic seminary schools around the courtyard, and their doors used to open to the shrine. However, Karbala's municipality destroyed all these schools and mosques and constructed a street around the shrine. The whole area of the courtyard is 1500 square meters. There are 65 porches around the courtyard, and there is a chamber in each porch. The chambers belonged to the students of the Islamic seminary schools in order to discuss their studies there, and some of them were allocated to kings, rulers, governors, and Islamic scholars. The shrine's courtyard has some gates each opening to a district in Karbala. The gates are located under tall porticos decorated with tiles on which Quranic verses with the Kufic calligraphy are inscribed. Bab al-Qibla (Arabic: باب القبلة, the gate of qibla): it is the oldest and the main gate of the courtyard. It is called so because it is located in the direction of the qibla. Bab al-Raja (Arabic: باب الرجاء, the gate of hope): it is located between Bab al-Qibla and Bab Qadi l-Hajat. Bab Qadi l-Hajat (Arabic: باب قاضی الحاجات): the gate is located across the Suq al-'Arab (Arab market), and it is called so after one of Imam al-Mahdi's (a) titles (Qadi l-Hajat: the satisfier of people's needs). Its height is five meters and its width is 3.5 meters. Bab al-Shuhada (Arabic: باب الشهداء, the gate of the martyrs): the gate is located between the eastern side on the pilgrims' way to Abu l-Fadl al-'Abbas's (a) shrine. It is called so after the martyrs of Karbala. Bab al-Karama (Arabic: باب الکرامة, the dignity gate): it is located in the furthest distance in the northeastern side of the courtyard, near Bab al-Shuhada. It is called so after Imam al-Husayn's (a) dignity. Bab al-Salam (Arabic: باب السلام, the greeting gate): it is located in the middle of the northern side, and it is called so because at this gate, people used to greet Imam al-Husayn (a). Bab al-Sidra (Arabic: باب السدرة, the gate of cedar): it is located in the furthest point in the northwestern side of the courtyard, and it is called so because of the cedar tree that grew near Imam al-Husayn's (a) grave in the 1st/7th century by which pilgrims found the location of the grave. Bab al-Sultaniyya (Arabic: باب السلطانیة, the Sultan gate): it is located on the western side of the courtyard, and it is called so because it was built by an Ottoman Sultan. Bab Ra's al-Husayn (Arabic: باب رأس الحسین, the gate of al-Husayn's head): it is located in the middle of the western side of the courtyard, and it is called so because it is across the head of Imam al-Husayn (a). Bab al-Zaynabiyya (Arabic: باب الزینبیة, the gate of Zaynab (a)): it is located on the southwestern side of the courtyard, and it is called so because it is near the Zaynabiyya hill (tall al-Zaynabiyya) or Maqam Zaynab. There is a tall dome over Imam al-Husayn's (a) mausoleum, covered with pure gold. The lower part of the dome contains ten windows to the outside. The dome is 37 meters high. It looks like an onion from the outside. Within ten meters from the south of the shrine, there are two large golden minarets that are about 25 meters high with four meter diameters. The two minarets were built in 786/1384-1385 during the period of Uways al-Jalayiri and his son, Ahmad. The Golden Portico is located on the southern side of the courtyard with a tall ceiling. It consists of three parts: the middle part which is the tallest and two shorter lateral parts. The part under the Portico is separated from the courtyard by metal fences that are located in the middle of pillars. People go inside the shrine from the two lateral sides. The walls of the Portico are coated with pure gold, and the upper parts of the walls are covered with tiles. The shrine's Gunbad Khana—the place above which the dome is located—is surrounded by four porches on its four sides. The width of each porch is five meters, the length of northern and southern porches is 40 meters, the length of eastern and western porches is about 45 meters, and the height of each porch is 12 meters. The western porch which used to be called the porch of 'Imran b. Shahin is now called the porch of Sayyid Ibrahim al-Mujab. This is because al-Sayyid Ibrahim, Imam Musa al-Kazim's (a) grandson, is buried there. Some Islamic scholars are also buried in the western porch. The eastern porch that used to be called the porch of Aqa Baqir is now called the porch of fuqaha because some faqihs are buried there. The southern porch is known as the porch of Habib b. Muzahir who is buried there. There is a small silver darih on his grave, which was renewed on Jumada II 10, 1410/January 8, 1990. The porch also includes the graves of well-known Shiite scholars. The northern porch was built by Shah Safi, and is called the porch of the kings because Qajar kings are buried there. Darih of Imam al-Husayn (a) which dates back to Qajar era. Under the dome, there is a large silver, polygonal darih, in which the graves of Imam al-Husayn (a) and his sons, 'Ali Asghar and 'Ali al-Akbar, are located. Different darihs have been built and installed on Imam al-Husayn's (a) grave in different periods. The last time when the darih was changed was in 2011. 'Ali al-Akbar is buried below Imam al-Husayn's (a) feet. The two lower sides of the darih belong to 'Ali al-Akbar and the martyrs of Banu Hashim. This part is adjacent to the exterior part of the darih. 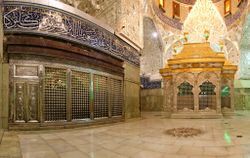 Thus the mausoleums of the martyrs of Banu Hashim are located besides 'Ali al-Akbar and below Imam al-Husayn's (a) feet. According to hadiths, when Banu Asad buried the martyrs of Karbala, they buried the corpses of Banu Hashim—who had gathered in one camp—below Imam al-Husayn's (a) feet, and then some meters below that, they buried the other martyrs of Karbala. All martyrs of Karbala —except Abu l-Fadl (a), Hurr b. Yazid al-Riyahi, and Habib b. Muzahir— are buried near Imam al-Husayn's (a) grave on the southeastern side of his grave. These graves are located in a 12-meter chamber with an inlayed box and a silver window. 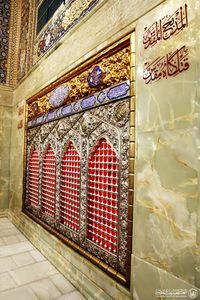 Above the window there are tiles in which the names of 120 martyrs of Karbala and a prayer addressed to them are inscribed. Darih of the Killing Zone. The killing zone is the place in which Imam al-Husayn (a) was decapitated. The place has a special chamber with a silver door and a window towards the courtyard on the southwestern side of Habib b. Muzahir's porch. Its floor is covered with marbles, and it has a cellar with a silver door. "Al-Ha'ir al-Husayni" is the area of Imam al-Husayn's (a) mausoleum. This is called so because when al-Mutawakkil al-'Abbasi ordered the destruction of the mausoleums of Imam al-Husayn (a) and the martyrs of Karbala, he ordered his agents to submerge the place with water. The water surrounded the grave without flowing over the grave. This place includes the main center of Imam al-Husayn's (a) shrine, the dome, the darih, and the graves of the martyrs of Karbala. The shrine's treasury is located on its northern side. It contains many precious stuff and work donated by kings and rulers of Islamic territories in different centuries. The shrine's library is located on the eastern side of the shrine. It contains precious copies of the Quran. Umm Musa, al-Mahdi al-'Abbasi's mother, appointed some people as administrators of Imam al-Husayn's (a) shrine. She gave them salaries. Harun al-Rashid did the same. These people were the first boards of trustee of the shrine. Since 'Alawis constituted the majority of people in Karbala, the governance of the city was in the hands of their naqib. A naqib or the head of 'Alawi sadat was of a high social and political ranking with special authorities. A person had to fulfill some requirements in order to occupy the position. It was specific to 'Alawi households and was transferred from one 'Alawi household to another provided that they satisfied some conditions. One of the most important tasks was the administration of 'Alawi affairs as well as Imam al-Husayn's (a) shrine. After the fall of Baghdad by Mongols in 656/1258, there is little report of how the shrines of Imam al-Husayn (a) and Abu l-Fadl (a) were administered. In early 8th/14th century, some people from Banu Asad, who could extend their dominance in the nearby territories, occupied the administration of the shrine. Most people who occupied the trusteeship of the shrine were from two 'Alawi tribes: Al Zuhayk and Al Fa'iz who consecutively occupied the position of naqib in Karbala: when one tribe was a naqib, the other occupied the trusteeship. The trusteeship of the shrine managed to lead people against the Wahhabi attacks to Karbala in 1216/1801 to 1220/1805 as well as in Najib Pasha's attacks in 1258/1842. After the latter event in which Karbala was smashed down, the power of the trusteeship was lost so that for two centuries, people from non-'Alawi households could control the trusteeship of the shrine. The trusteeship was in the hands of non-'Alawis until late 13th/19th century. After that, it was controlled by Al Tu'ma household until the end of the Ottoman government and the subsequent periods. Many hadiths have emphasized the importance of visiting Imam al-Husayn's (a) shrine. Such an emphasis is not made on visiting the shrines of other Imams. Some hadiths have even made it obligatory to visit Imam al-Husayn's (a) shrine. According to a hadith from Imam al-Baqir (a), "if people knew what advantages there are to visiting Imam al-Husayn's (a) mausoleum, they would die out of passion". 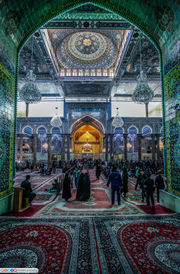 He then added: "whoever visits al-Husayn (a) out of passion, he would be rewarded like a thousand accepted hajjs and a thousand rewarded 'umras and a thousand martyrs of the Battle of Badr and a thousand days of fasting and a thousand accepted charities and a thousand emancipations of slaves for the sake of God". Shiites frequently visit Imam al-Husayn's (a) shrine. Most pilgrims of the shrine gather on days of Ashura, Arba'in, and Sha'ban 15 in Karbala. A traveler can say his prayers in the shortened or complete forms in the shrine, but it is more virtuous to say them completely. The ruling generalizes to the whole area under the dome, the porches and its adjacent mosque. It is very rewarding to say prayers in the shrines of Imams (a), especially those of Imam 'Ali (a) and Imam al-Husayn (a). A person should not say prayers ahead of the graves of the Prophet (s) and Imams (a). If saying prayers ahead of them counts as a case of disrespect, then it would be forbidden, though the prayer is not invalid (that is, it does not need to be said again). If there is barrier between the person and the grave, then there is no problem with saying prayers ahead of the graves, but the box of the darih or the cloth covering it do not count as barriers. It is supererogatory to wear perfumes while visiting the shrines of Imams (a), but it is not supererogatory to do so while visiting Imam al-Husayn's (a) shrine. In saying prayers, it is supererogatory to perform sajda on the soil of Imam al-Husayn's (a) grave. Such a prayer is more rewarding. It is forbidden to eat any kind of soil, except for a little bit of Imam al-Husayn's (a) soil for healing purposes. It is supererogatory to feed newborn babies with such a soil. It is obligatory to respect Imam al-Husayn's (a) soil, and it is forbidden to disrespect it in any ways, including: making it dirty, throwing it to a disrespectful place, and if it is thrown in a disrespectful place, it should be taken out. It is supererogatory to put some soil of Imam al-Husayn's (a) grave in a corpse's shroud before burying it, and mix it with their hanut (perfuming the dead body before burial). If a property is sent somewhere (such as a girl's dowry), it is supererogatory to put some of Imam al-Husayn's (a) soil with it. It is supererogatory to smell and kiss the soil and rub it over one's eyes. It is rewarding to touch the soil and rub it over other parts of the body. It is supererogatory to mention God with a misbaha whose beads are made of Imam al-Husayn's (a) soil. Even carrying such a misbaha is rewarding. ↑ Qurayshī, Marqad-hā wa makānhā-yi zīyāratī-yi Karbalā, p. 22. ↑ Āl Ṭuʿma, Karbalā wa ḥaram-hā-yi muṭahhar, p. 89. ↑ Āl Ṭuʿma, Karbalā wa ḥaram-hā-yi muṭahhar, p. 94-95. ↑ Āl Ṭuʿma, Karbalā wa ḥaram-hā-yi muṭahhar, p. 99. ↑ Āl Ṭuʿma, Karbalā wa ḥaram-hā-yi muṭahhar, p. 99-100. ↑ Āl Ṭuʿma, Karbalā wa ḥaram-hā-yi muṭahhar, p. 100-102. ↑ Āl Ṭuʿma, Karbalā wa ḥaram-hā-yi muṭahhar, p. 103. ↑ Āl Ṭuʿma, Karbalā wa ḥaram-hā-yi muṭahhar, p. 103-104. ↑ Āl Ṭuʿma, Karbalā wa ḥaram-hā-yi muṭahhar, p. 104-106. ↑ Āl Ṭuʿma, Karbalā wa ḥaram-hā-yi muṭahhar, p. 110. ↑ Āl Ṭuʿma, Karbalā wa ḥaram-hā-yi muṭahhar, p. 110-111. ↑ Āl Ṭuʿma, Karbalā wa ḥaram-hā-yi muṭahhar, p. 111. ↑ Āl Ṭuʿma, Karbalā wa ḥaram-hā-yi muṭahhar, p. 111-112. ↑ Āl Ṭuʿma, Karbalā wa ḥaram-hā-yi muṭahhar, p. 170-175. ↑ Āl Ṭuʿma, Karbalā wa ḥaram-hā-yi muṭahhar, p. 193-203. ↑ Āl Ṭuʿma, Karbalā wa ḥaram-hā-yi muṭahhar, p. 184. ↑ Āl Ṭuʿma, Karbalā wa ḥaram-hā-yi muṭahhar, p. 190-191. ↑ Āl Ṭuʿma, Karbalā wa ḥaram-hā-yi muṭahhar, p. 163. ↑ Āl Ṭuʿma, Karbalā wa ḥaram-hā-yi muṭahhar, p. 156-157. ↑ Qāʾidān, ʿAtabāt ʿālīyāt Iraq, p. 122-123. ↑ Qummī, Amākin-i zīyāratī wa sīyāḥatī-yi Iraq, p. 46. ↑ Qummī, Amākin-i zīyāratī wa sīyāḥatī-yi Iraq, p. 118-119. ↑ Āl Ṭuʿma, Karbalā wa ḥaram-hā-yi muṭahhar, p. 162. ↑ Qāʾidān, ʿAtabāt ʿālīyāt Iraq, p. 101. ↑ Āl Ṭuʿma, Karbalā wa ḥaram-hā-yi muṭahhar, p. 124. ↑ Muqaddas, Rāhnamā-yi amākin-i zīyāratī wa sīyāḥatī dar Iraq, p. 223-225. ↑ Āl Ṭuʿma, Karbalā wa ḥaram-hā-yi muṭahhar, p. 217-220. ↑ Qurayshī, Marqad-hā wa makānhā-yi zīyāratī-yi Karbalā, p. 30. ↑ Fallāḥ zādih, Aḥkām-i fiqhī-yi safar zīyāratī-yi ʿatabāt, p. 14. ↑ Fallāḥ zādih, Aḥkām-i fiqhī-yi safar zīyāratī-yi ʿatabāt, p. 17. ↑ Fallāḥ zādih, Aḥkām-i fiqhī-yi safar zīyāratī-yi ʿatabāt, p. 17-18. ↑ Fallāḥ zādih, Aḥkām-i fiqhī-yi safar zīyāratī-yi ʿatabāt, p. 36. ↑ Fallāḥ zādih, Aḥkām-i fiqhī-yi safar zīyāratī-yi ʿatabāt, p. 57-59. Āl Ṭuʿma, Salmān Hādī. Karbalā wa ḥaram-hā-yi muṭahhar. Tehran: Mashʿar, n.d.
Fallāḥ zādih, Muḥammad Ḥusayn. Aḥkām-i fiqhī-yi safar zīyāratī-yi ʿatabāt. Tehran: Markaz-i Taḥqīqāt-i Ḥajj, n.d.
Muqaddas, Iḥsān. Rāhnamā-yi amākin-i zīyāratī wa sīyāḥatī dar Iraq. Tehran: Mashʿar, 1388 Sh. Qāʾidān, Aṣghar. ʿAtabāt ʿālīyāt Iraq. Tehran: Mashʿar, 1387 Sh. Qurayshī, ʿAbd al-Amīr. Marqad-hā wa makānhā-yi zīyāratī-yi Karbalā. Tehran: Mashʿar, 1391 Sh. 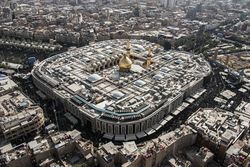 "The project of increasing height of the dome of holy shrine of Imam Husain (A.S) has been started", Shbestan News Agency, accessed May 14, 2017. This page was last edited on 29 December 2018, at 07:25.